MF DOOM is the man in the iron mask. The most mysterious figure in hip-hop has also become one of the most popular, supplying beats and rhymes for Gorillaz, De La Soul, Madlib, Danger Mouse, and Wu-Tang Clan, and drawing praise from heavyweights like Just Blaze, Nas, and Mos Def. Since 2002, MF DOOM has released numerous volumes of Special Herbs, one of the longest-running instrumental series in hip- hop history. 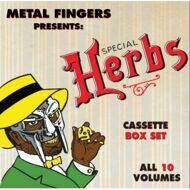 With obscure loops and dusty samples galore, Special Herbs is a must-have for any MF DOOM fan or hip-hop head. MF DOOM’s Special Herbs series now available on cassette for the first time in a limited edition 5xCassette box set!